I've been eyeing this book for a while, let me know how it is. It looks pretty cool. I think I read somewhere that he's doing another classic with a twist. Yeah, I'm curious too. I have a love/hate relationship with zombies. This looks really interesting! Yes, let us know. Ok, it's mostly hate. My first horror movie was "Return of the Living Dead." I love that movie and had no probs with zombies. In fact, I'd say I was pretty cool with zombs. Buddies even? Then I saw "28 Days Later." IDK what it was about that movie that stuck with me but I had a nightmare and can't watch the movie anymore (we own it too). Monkeys and zombies. Ew ew ew. The sad part: I've already known about this for like ever. 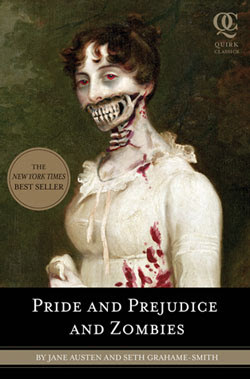 "Pride and Prejudice and Zombies transforms a masterpiece of world literature into something you'd actually want to read." ooh, really? Yay! I saw this in a store just yesterday..